Life just seems to be whizzing past and I have only just managed to sit down and start sorting through our photos of NYC back in May. I have done a couple of travel guide videos over on You Tube and also posted some of the amazing photos we got from the family photo shoot we booked (here and here if you fancy a look), but I didn’t want to neglect documenting it on my blog too. 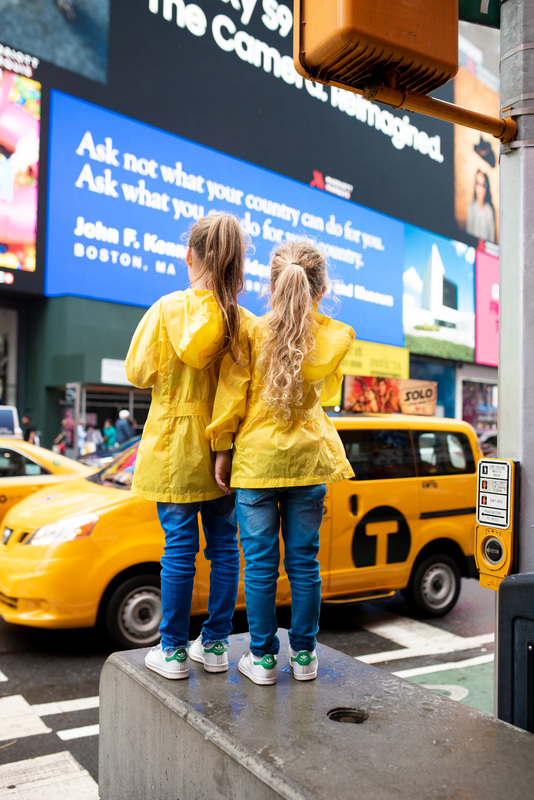 I have a few ideas for posts, I think I am going to do a planning a trip to NYC with kids post as lots of people asked how we went about it etc, plus I also wanted to do a couple of travel guide posts as well, but first I thought it would be nice to share some of our favourite photos from our trip. I should probably start by saying that our trip to NYC was up there with one of the very best trips we have ever been on. 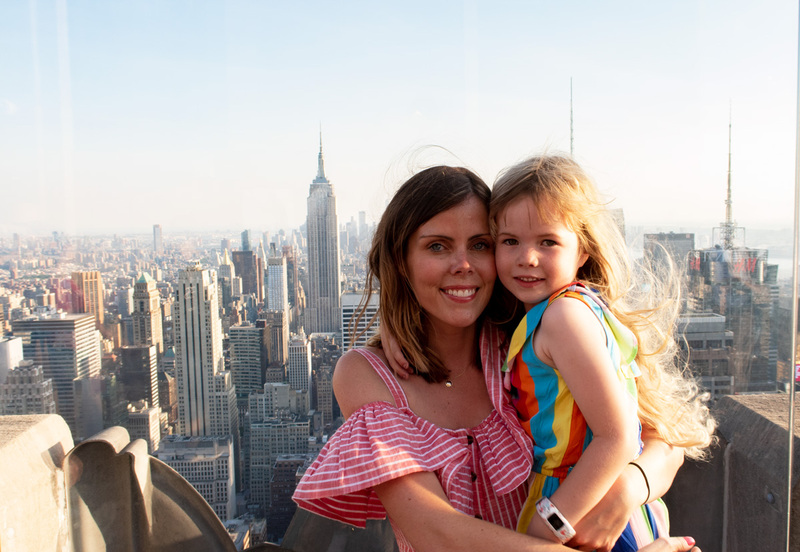 We are incredibly fortunate to travel a fair bit as a family as after working in the travel industry for many years this blog has inevitably become very travel focused, but this was quite honestly up there with one of the best experiences of my life. Jon and I had both visited NYC previously but over 10 years ago and not together, and I had not really ever explored much, so it was always somewhere we had wanted to visit. We got an email one Sunday informing us that it was the last day of the British Airways sale and we found really reasonable flights for a family of 5, so we decided to just book it on a little bit of an out of character impromptu whim. I don’t know why it was such a good holiday, but it just really was. 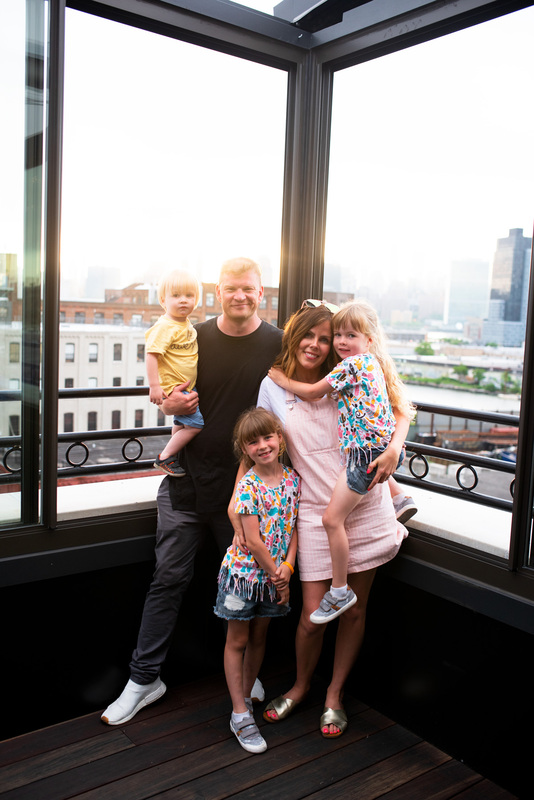 We found New York to be incredibly family friendly, something which we weren’t sure about before we travelled. The weather was sunny and hot which helped (bar a couple of days of torrential rain) and I did a lot of research before we travelled so I felt like we were prepared with fun things to do with the children. 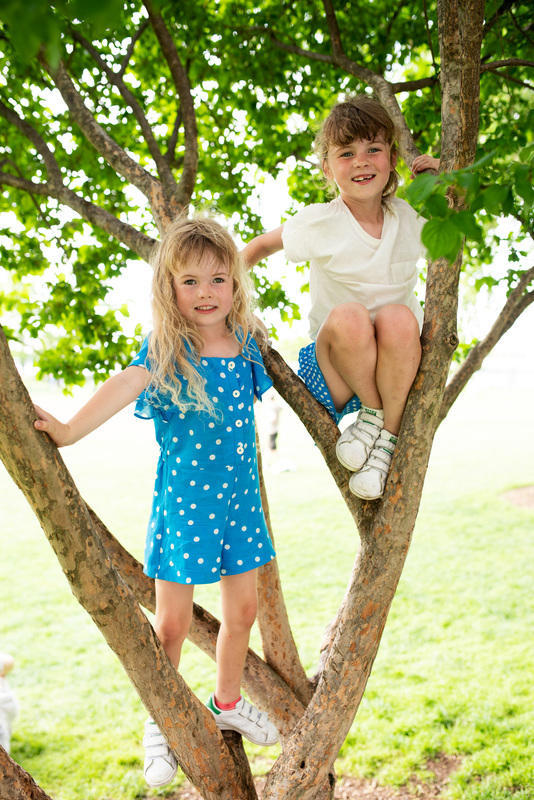 The children were tired but overall they adapted well and it just felt laid back, relaxed and fun. I have so many wonderful memories I will treasure forever. We arrived into the city late on our first night and it was already dark. So we woke up the next morning and headed straight out to explore the area around our hotel. 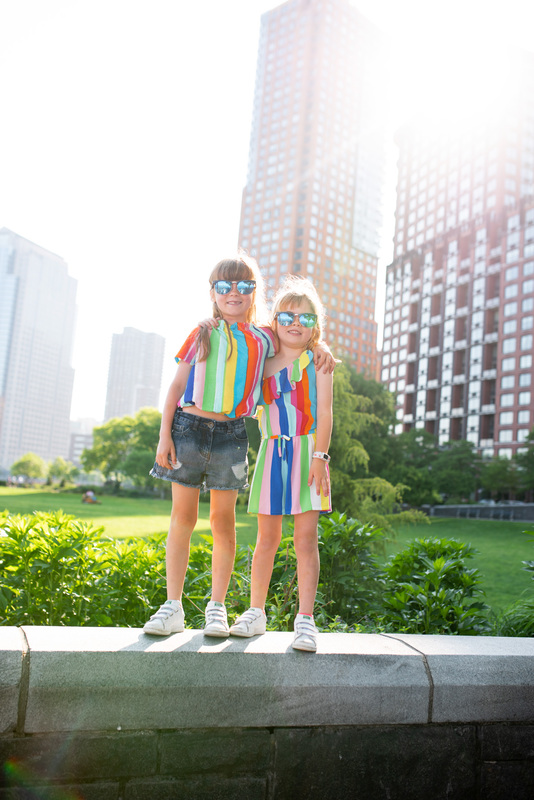 We were staying at The Conrad Hotel in Battery Park City and I highly recommend this area- it was away from the craziness of Manhattan but only 20 mins on the subway/in a taxi. The World Trade Center is about 5 minutes walk. 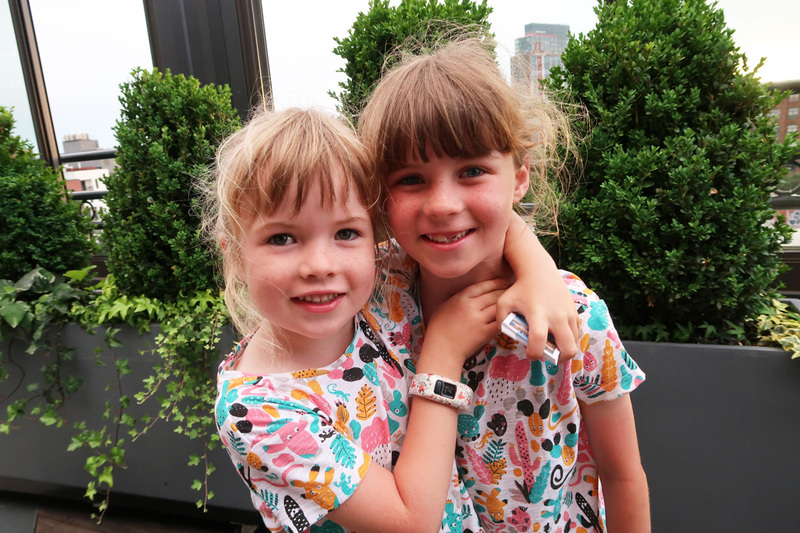 I love these photos of them, full of excitement about the start of their holiday. 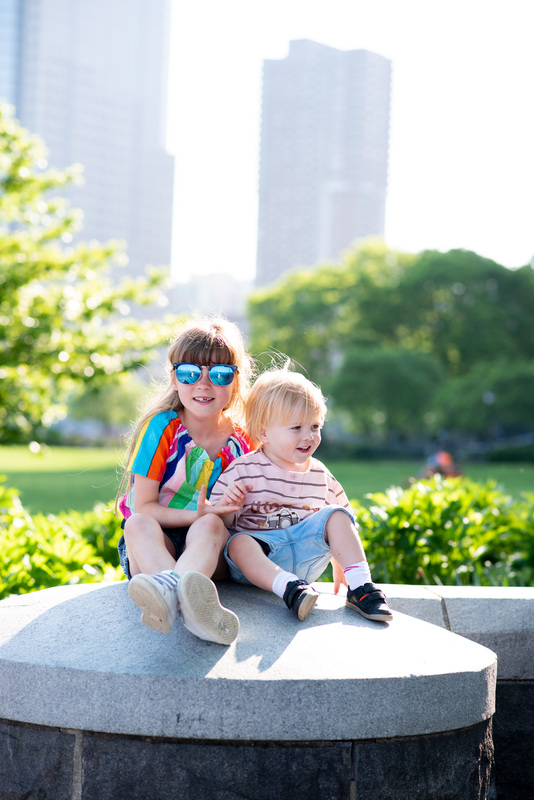 In the Battery Park area there are loads of green open spaces. One of them houses the Seaglass carousel. This was one of the highlights of our trip and I definitely recommend a visit. 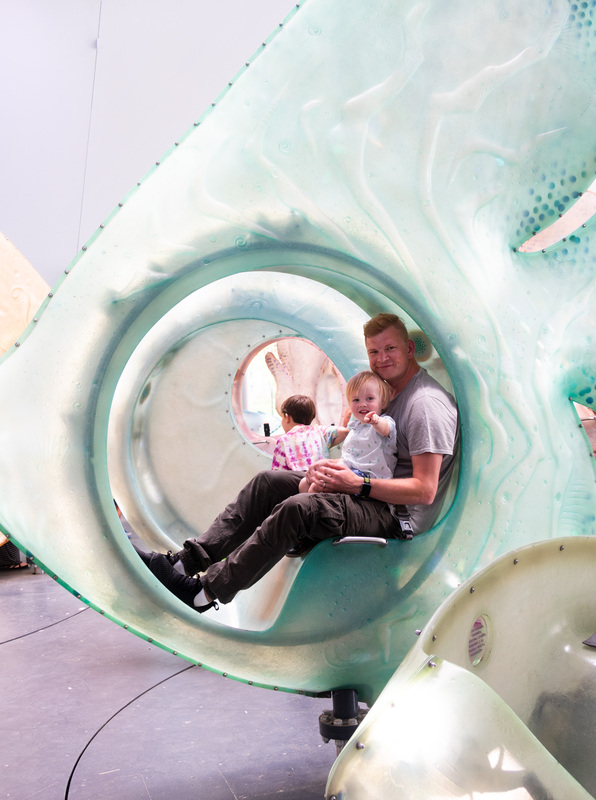 It is a carousel with a difference, as you sit in or on a colour changing fish. It was so beautiful and all three of the children loved it, so we had to go on twice. 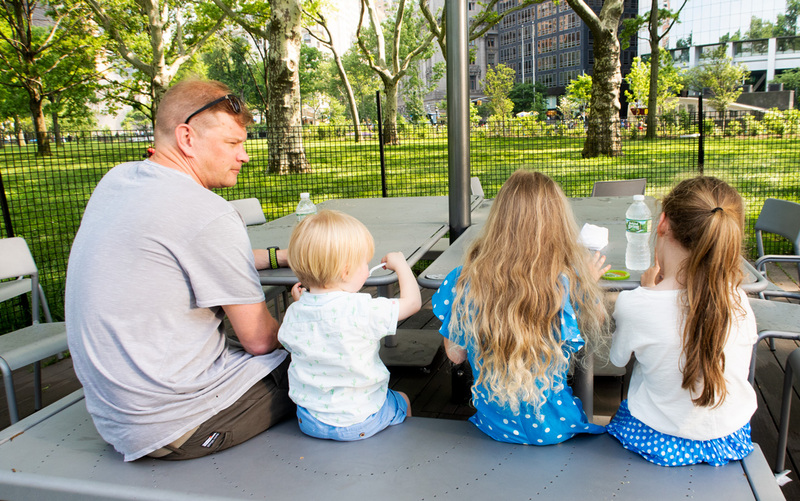 Chilling having an ice cream and a drink in the sunshine in Battery Park. 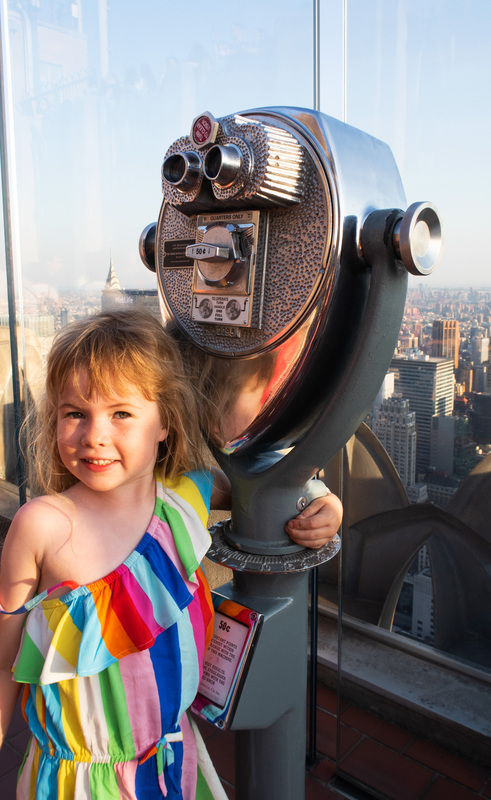 The key we found to doing NYC with kids was to take it slow. 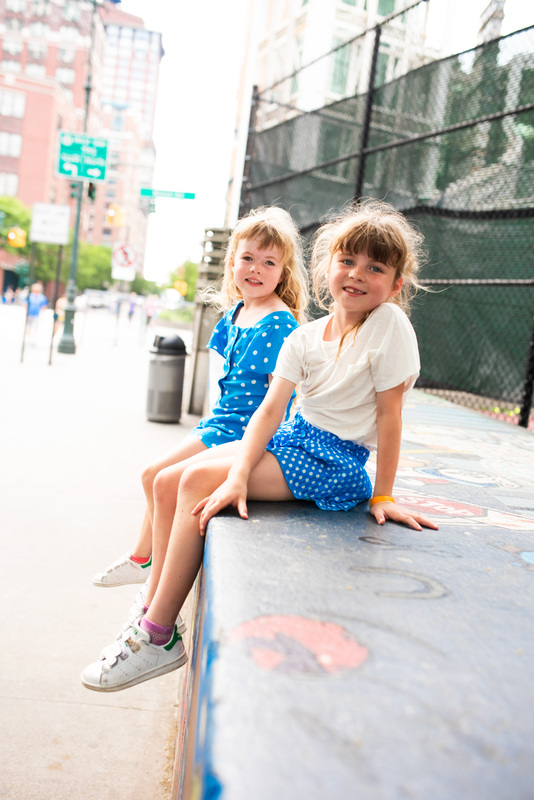 We spent a lot of time in parks having down time. This was late afternoon in a park just outside our hotel. I love this photo so much. Just pure happiness on those faces. And this one. I don’t know what I did to deserve these beautiful girls but I am so grateful they are mine. Trying to look like ‘New Yorkers’. We went up to the Top of the Rock and it was amazing. You could see for miles around and it was the perfect photo opportunity with the iconic Empire State building in the background. One of the days we headed to Flour Shop which I must admit I did just because I saw it on instagram. But it was so worth it, the cakes were delicious and it was the coolest little shop. 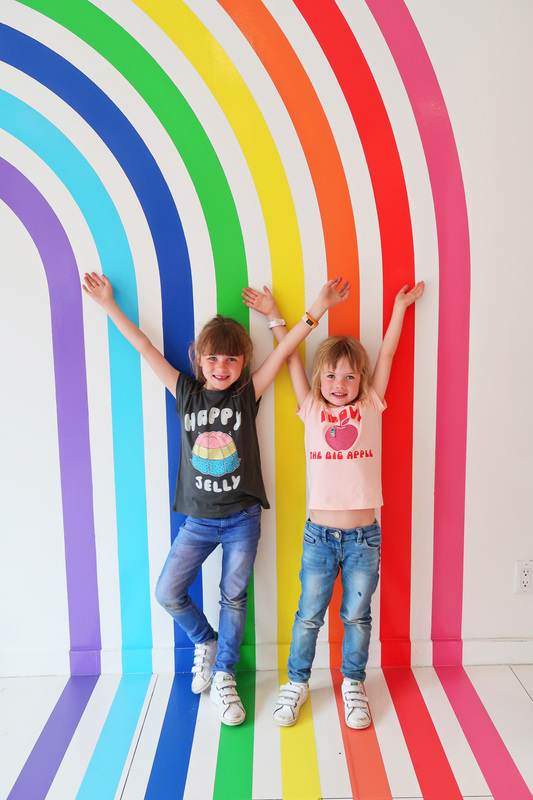 I loved this brightly coloured photo wall- can I have one in my house? 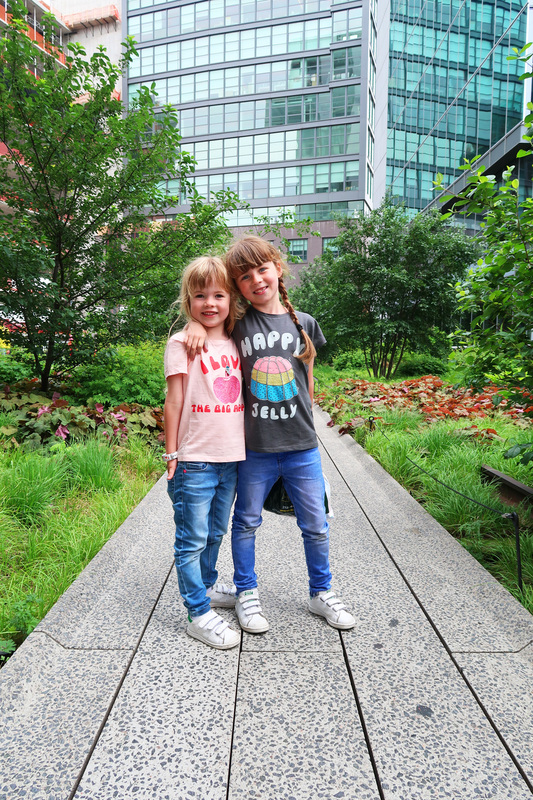 Two happy little girls checking out the Highline in Chelsea- the Highline is an urban garden built on disused railway tracks above the city. It’s well worth a visit. I don’t even know why I love this one, I just do. She is such a happy little girl and there’s never a dull moment with her around, she is the family joker. I don’t know why but I just love this photo of myself and Wren so much. 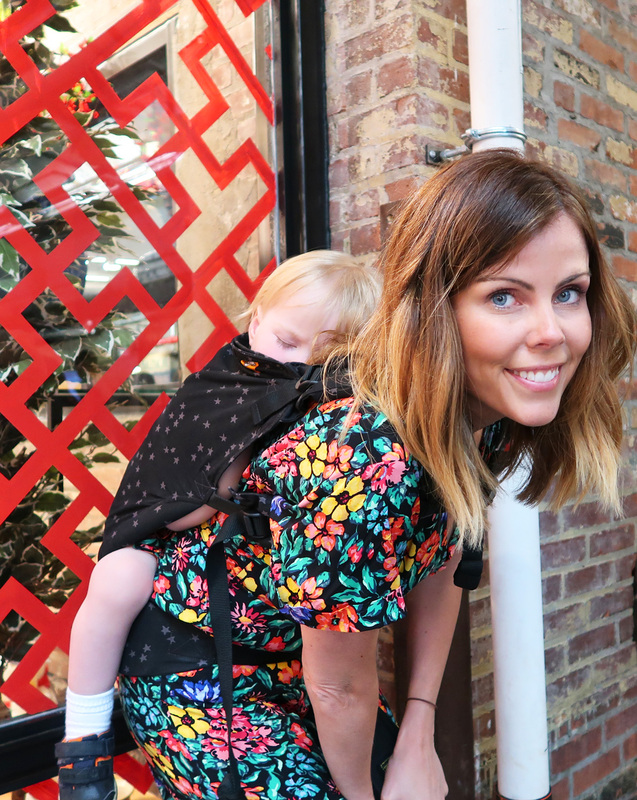 I didn’t really use baby carriers with Maddie and Lottie, nor when Wren was a baby, but when we knew we were going to NYC we decided to get him a toddler carrier as we knew we would be doing so much walking. I just wish I had got into it sooner, I love it so much and it was so useful having on holiday. He spent so much of the day either in there chatting and taking in the sights, or snuggling down and having a nap. The girls also took a picture of me and Jon which they wanted to do all holiday, for some reason they love taking photos of us. Most of them are either blurry or with cut off limbs, but this one was a reasonable effort and it makes me smile when I think of them behind the camera getting all excited about having the opportunity to take a photo. NYC really truly is the coolest city I have ever been to. I love loads of cities, I loved San Francisco for it’s laid back vibe, Amsterdam for being so family friendly and cool, but NYC is just amazing. I love this photo of the skyscrapers and all the cars. NYC traffic is mental. I am not a big fan of massively busy tourist areas but I felt like we couldn’t go to NYC and not go to Times Square. 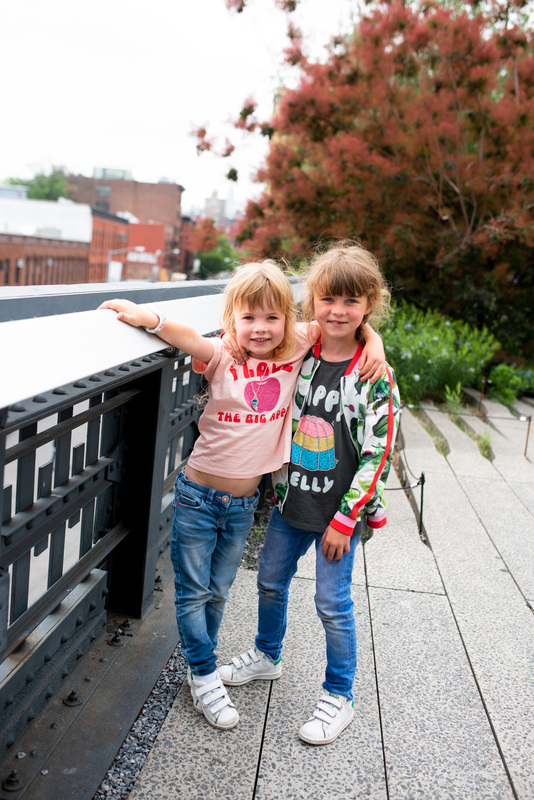 We headed there, took it all in for a few minutes and then left, but I couldn’t resist snapping this photo of the girls enjoying the bright lights of New York City. Likewise we had to go and check out the flat iron building. I love this photo of my girls. Of course they argue but they really are the best of friends too. It’s a pleasure to see them growing up so close and I think going on holiday really heightens this and their relationship blossoms. 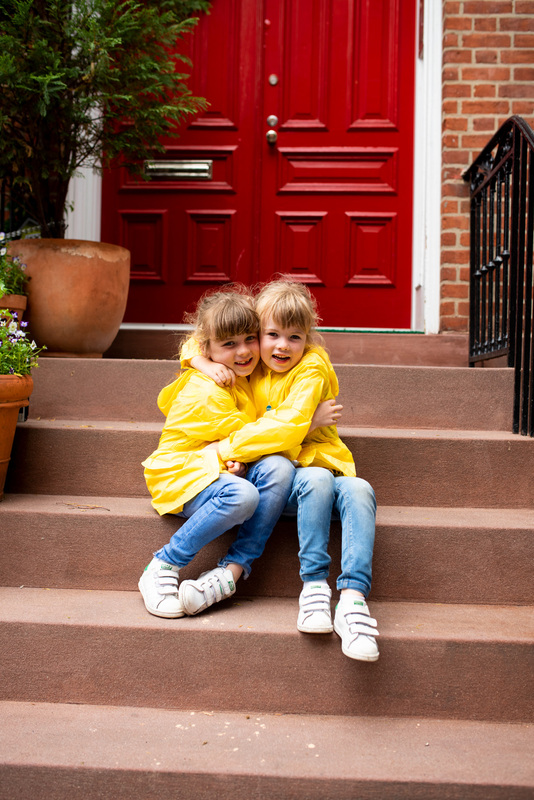 Some more cuddly photos this time on a step in Greenwich Village. 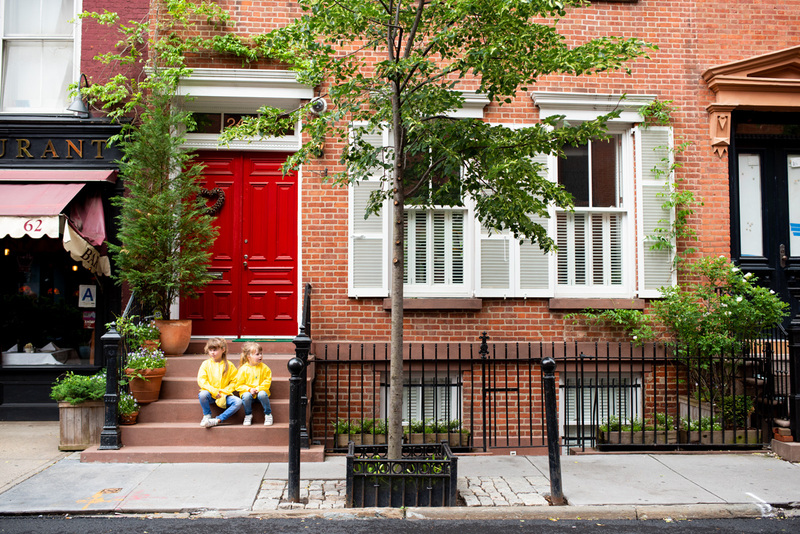 NYC is full of incredible houses and places to photograph. 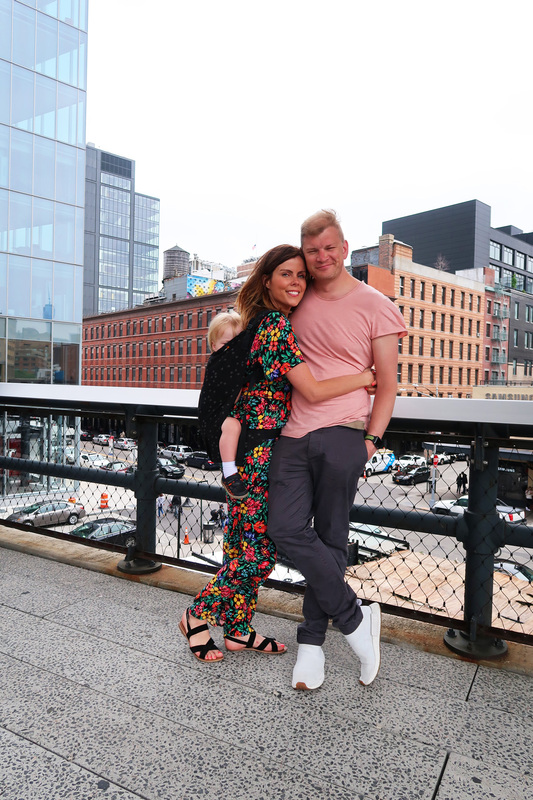 We headed over to Greenwich Village because I wanted to see the Friends Apartment and also Carrie Bradshaw’s apartment too- but the whole area was just a photo taking opportunity. This photo will never ever fail to make me smile. Like I mentioned above we wanted to go to check out the Friends apartment in Greenwich village. 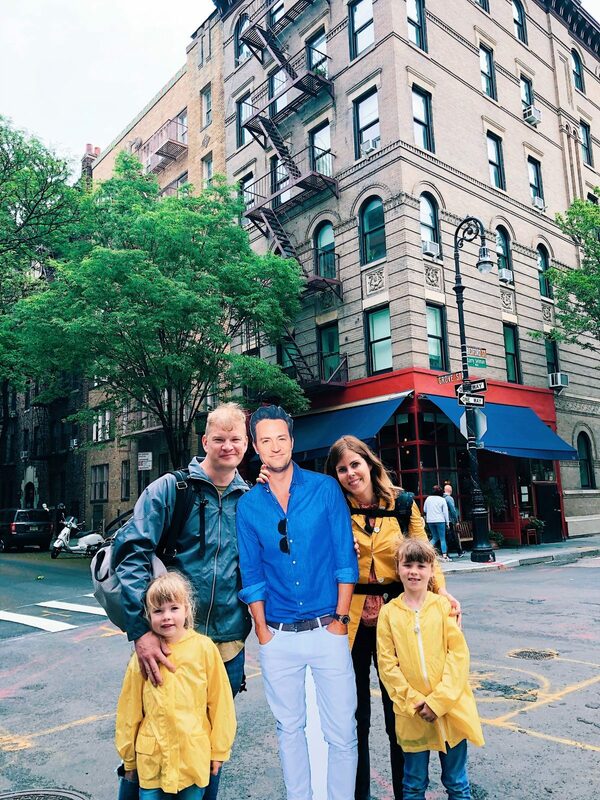 When we were there a man came up to us and said did we want a photo with his cardboard cut out of Chandler? We said yes and awkwardly posed with him, before the man charged us a dollar. So funny! He was a really well to do older man and apparently he lived nearby and popped down at the weekends to make a few dollars. I think this will forever be one of my favourites- the girls had no idea who Chandler was obviously and were looking at us like we were insane. 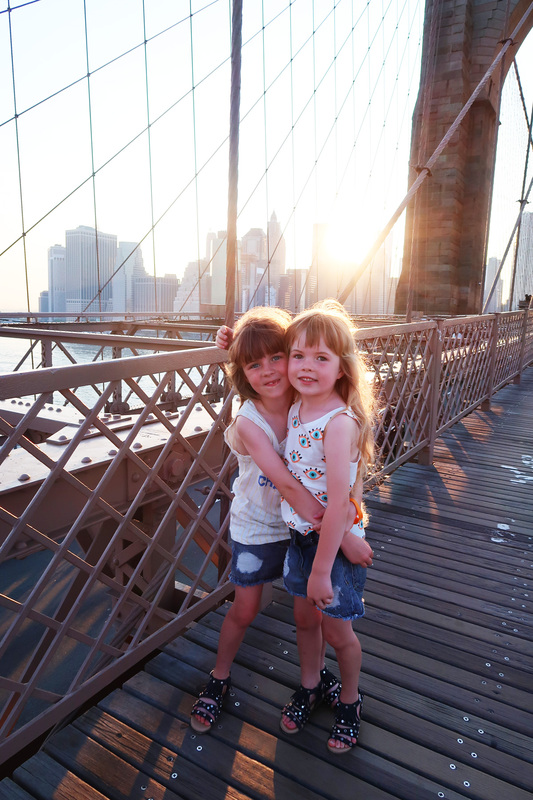 One of the most memorable moments of our trip was when we headed up on Brooklyn Bridge at sunset. It was where we had our family photos done but once Amanda our lovely photographer had gone we stayed up there and watched the sunset. Biking over Brooklyn Bridge has been on my bucket list for a long time, and while we did cycle along it with three young kids this time, just being up there with my family was more than worth it. For a long time we couldn’t have afforded any holiday, let alone one like this one and I am just so grateful that I get to experience these things. Travelling is my dream come true. Likewise another lovely memory was sitting back and watching them skim stones down in DUMBO in Brooklyn. 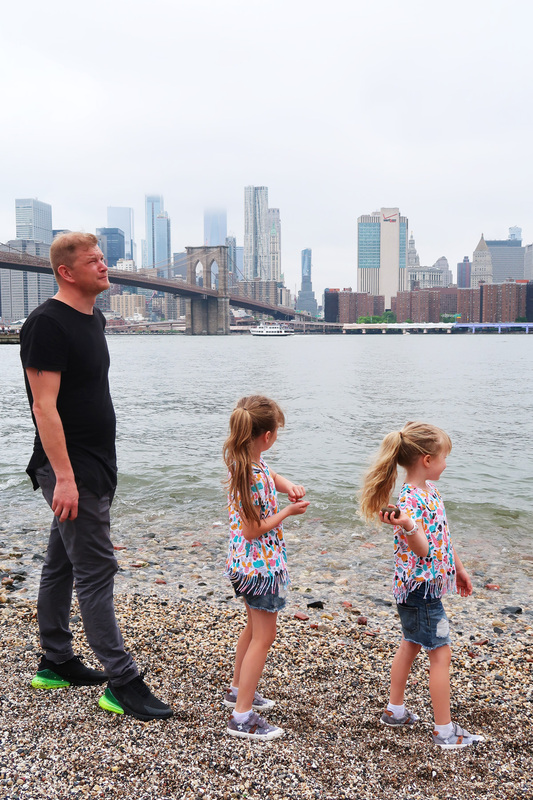 We spent the whole day in DUMBO (which stands for Down Under The Manhattan Bridge Overpass) because there is so much to do, but they loved skimming stones in the murky Hudson River while I sat back and looked at the amazing skyline. Our lovely hotel in Brooklyn The Box House Hotel had a fantastic rooftop with views of the city and the Manhattan skyline. We went up there on our last evening just as the sun was setting, but at the same time a big storm was brewing and so the sun promptly got covered by a huge cloud. But we took some photos and the bottom one is one of my favourites. 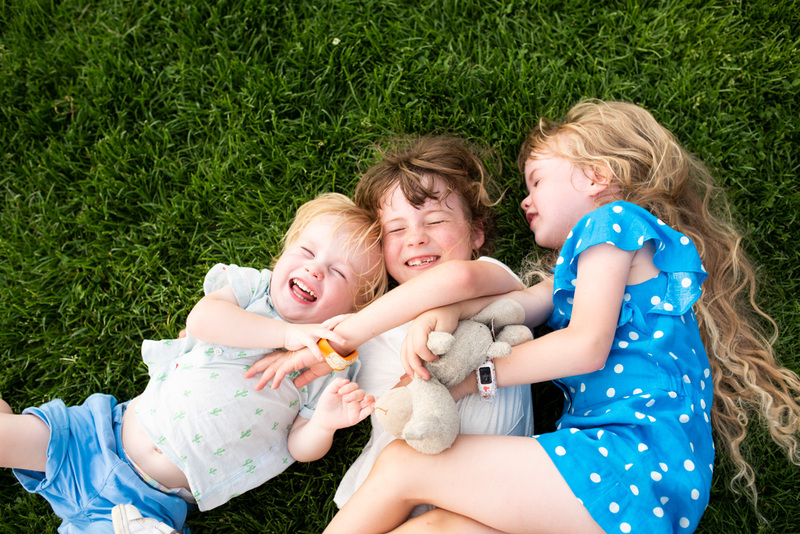 I also love this one of the girls cuddling and also Jon and Wren- it is very hard to get Wren to look at the camera let alone smile so while it isn’t a complete smile, this mini smirk still makes me happy. Finally these last few photos are from a crazy thing we did in Brooklyn on our last day. 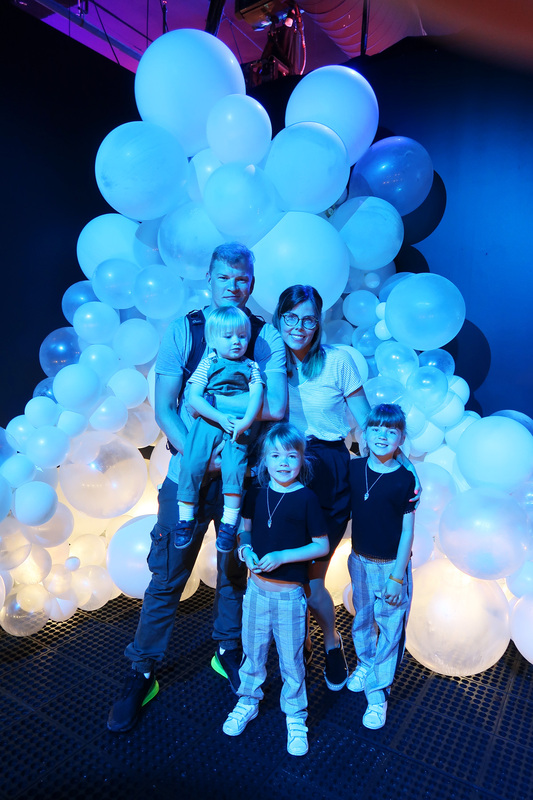 We went to a place called Dream Machine, I honestly have no idea how I even found it but I am always looking for weird and crazy things to do that aren’t your usual tourist thing. Dream Machine was a temporary pop up art installation of sorts, which I think was predominately done to take instagram photos. 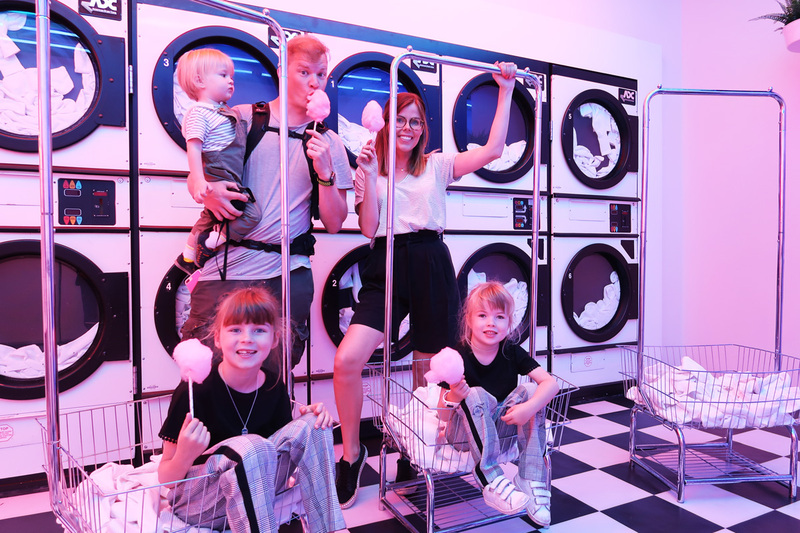 It was surreal with bubble blowing machines, cotton candy laundrettes, walls of mirrors and a giant swimming pool ball pool. 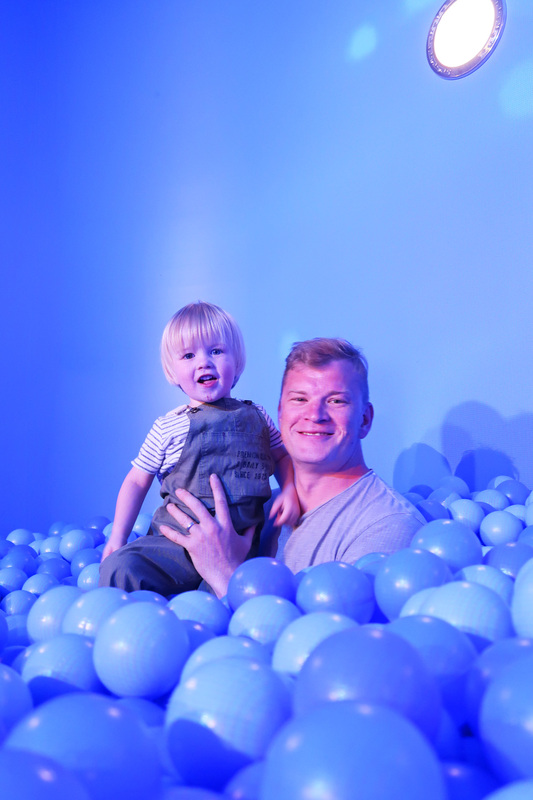 Jon and the girls were a bit unsure when we went in but they soon realised what fun it was and even though their Mummy has crazy ideas sometimes, a lot of the time they are quite fun. 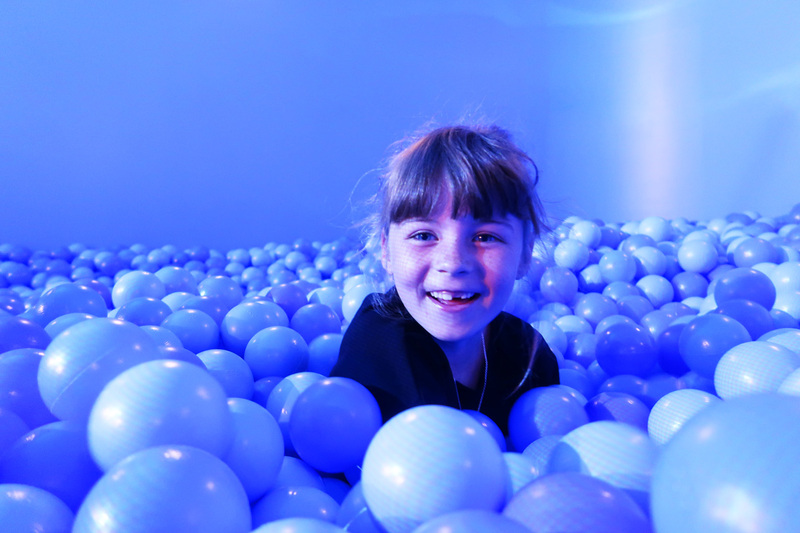 I love Maddie’s happy face in the ball pool and the one of all of us I think would be our album cover if we ever released a family music album (which we definitely wouldn’t as we are all tone deaf). And there you have it. 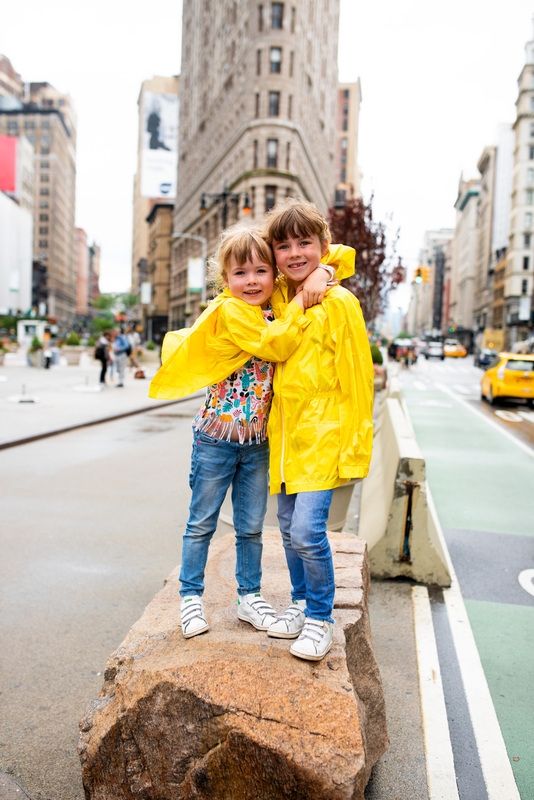 Those are just some of my favourite photos from our amazing trip in New York City. 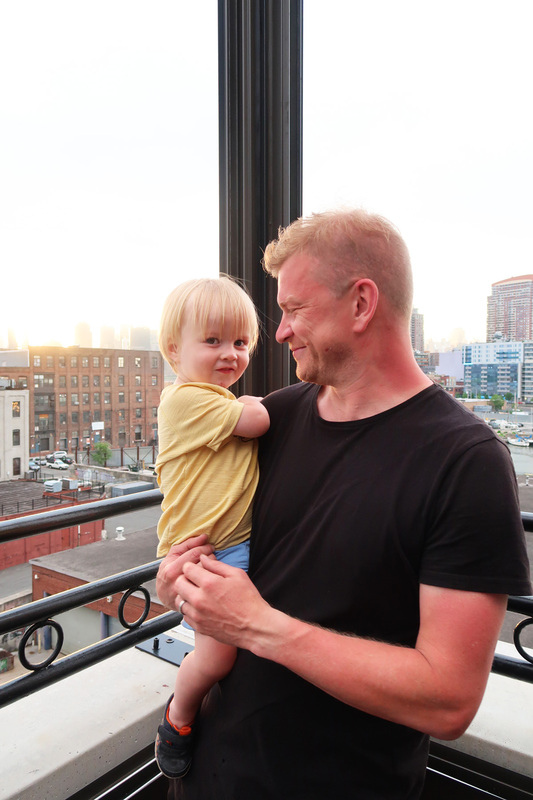 As I mentioned at the start of my post I have loads more I want to write about our time in NYC, it’s just trying to find the time to take on the mammoth task of writing them up. I have included my travel guides (still need to do our time in Brooklyn) if you want to have a watch. Such beautiful photos. NYC is on my list to visit now after seeing your trip on instagram. Such beautiful photos!! 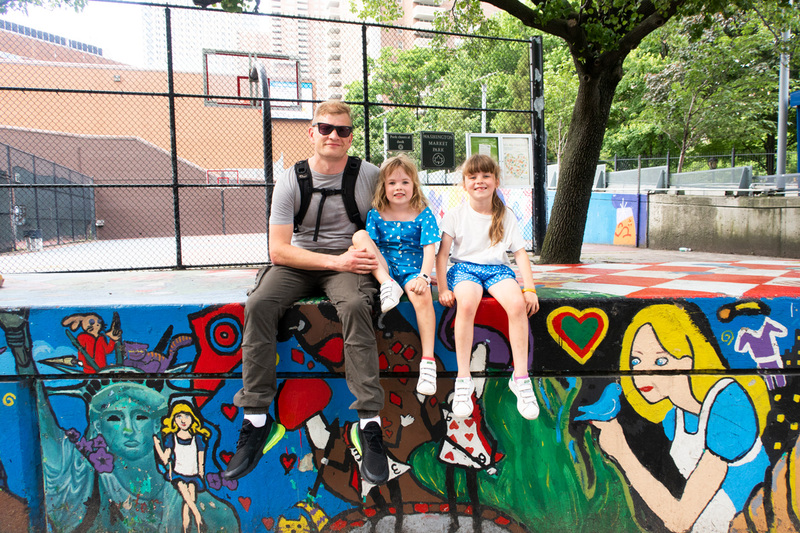 Was so interested following your trip and great to see all the amazing things to do in NYC with kids! Beautiful photos! Such a wonderful, fun-filled trip to NYC! 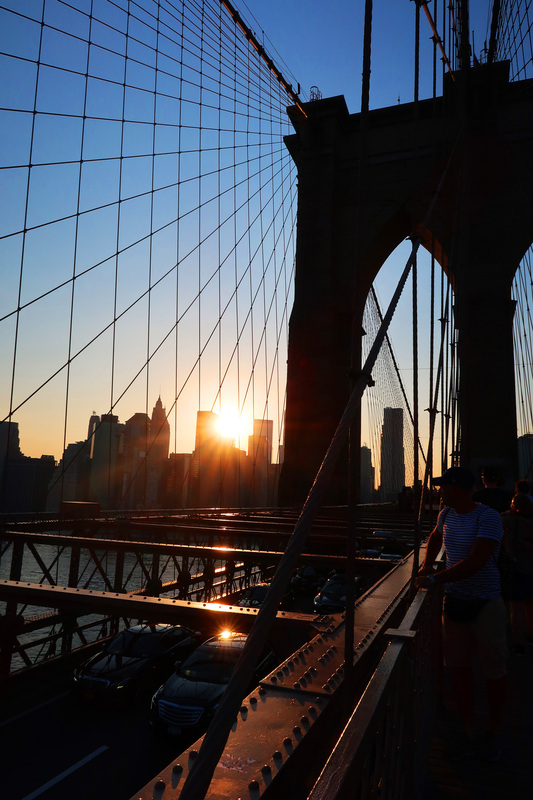 Such lovely photos as always Katie – that one of Brooklyn Bridge at sunset is gorgeous! 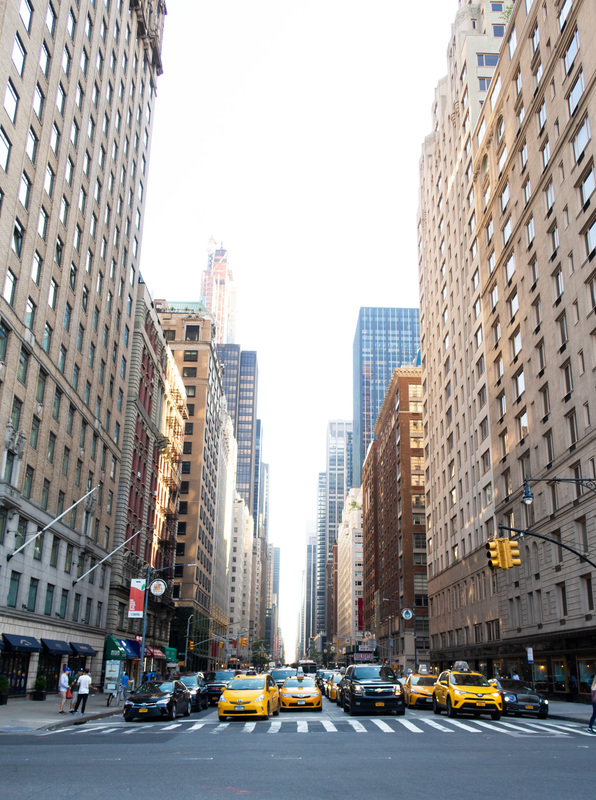 I really enjoyed following your travels to New York – it’s been top of my bucket list for the longest time.